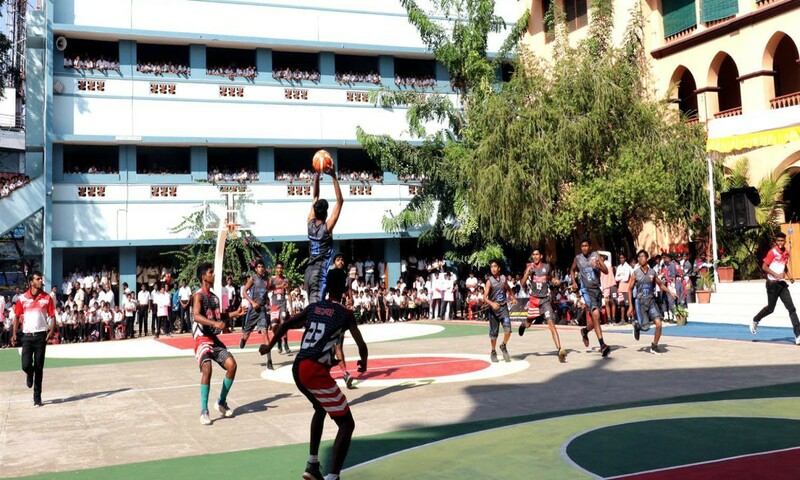 St Joseph's School, Trivandrum, Jan 17th-Hosts St Joseph’s HSS, Trivandrum books semi final birth along with strong contenders GV Raja Sports School, Mailom , St Thomas HSS , Trivandrum and St Thomas HSS, Kozhencherry for the 22nd Fr Ephrem Trophy . In the highly competitive knock out matches that took place early today saw GV Raja Sports school maintaining their reputation as one of the most dangerous sides in the competition. GV Raja downed the B team of St Joseph’s HSS, Trivandrum, by a margin of 39-28.Ashik with 13 points and Ajsal with 8 points kept the pressure over St Joseph’s defense throughout the match. Nabeel with 14 points top scored for St Joseph’s B team. In another match St Thomas, Kozhencherry won over St John’s HSS by a margin of 48-25. Shibin and Joshua of St Thomas scored 18 and 12 points respectively to inflict damage over St John’s. Amal top scored for St John’s with 14 points. GV Raja will play St Thomas, Kozhencherry while home team St Joseph’s HSS will take on St Thomas HSS, Trivandrum, in exciting semi final clashes set to happen here on Thursday. The winners of the semi finals will face off in the finals to be held here on Friday .